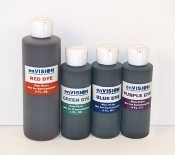 Vibrant Dye for Envision Groundwater Simulators, Kit includes 8 oz Red Dye, 4 oz Blue Dye, 4 oz Green Dye and 4 oz Purple Dye, Non-toxic. Kit also includes pipettes. MSDS Sheets available on our website.